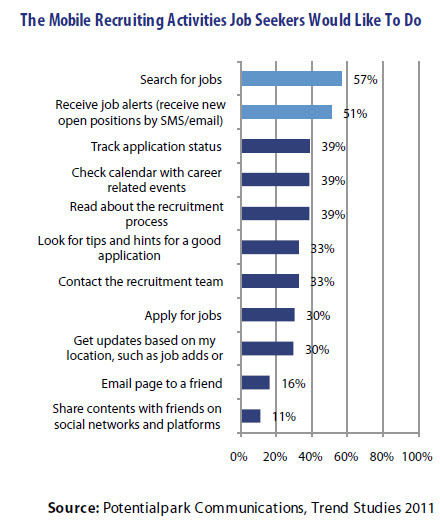 51% of respondents wanted job alerts sent to them either via email or SMS. This surprised me. Hasn’t this technology has been available for years? Whether it’s a job alert from Careerbuilder or from Charles Schwab, emailed job alerts have been a common feature to most Fortune 500 businesses. Heck, I received job alerts from the USDA Forest Service for years after I stopped working for them. And this was 5+ years ago. If the government has been doing this for a decade, these people must be sleeping under rocks. 33% of respondents wanted increase access to the recruiting team. Yeah – that’ll never happen. Recruiters get bombarded from all angles from applicants trying to gain the upper hand by pitching themselves over the phone, via email, facebook and twitter. When recruiting volume is high and they’re dealing with a lot of applicants, the last thing they want to do is explain to an applicant why they’re not going to be selected for an interview. I think location-aware technology offers a lot of promise – and also a lot of potential for abuse. An evil, bigoted organization could very well push low-wage, general labor jobs only to visitors from a certain area (insert any economically distressed urban area here) while pushing other better paying opportunities to others from more affluent areas. Customization and personalization are great, but we must always be wary of when personalizing gives way to outright exclusion. And sharing! I thought this would be higher up on the list of people’s concerns. It’s so EASY to enable multi-platform sharing, yet so MADDENING when websites fail to offer it. ← Mobile Job Searching – The Next Big Thing? It Already Is.